I have to tell you that for several reasons this Beach House decor project scared me a lot. But actually, once I felt the fear and did it anyway, I can't tell you how happy it made me. I was so buoyed by it, I gave my kids what they wanted for dinner, danced around the house to their squeals of joy, inspired by my good mood and was even kind to Mr Beach House, which is not always on the menu round here. I was worried about the solvents in the glue melting the rice paper of the original shade covering, of cutting straight and mucking up some of the prettiest fabric I have seen in ages, but it got to the stage where I needed content for the blog after mucking up another project, which you will know about if you follow in instagram and I just had to jump in. I intend to make two of these to sit at either end of the sofa in the media room, but wanted to see if I could put this together before I spent money on a matching lamp shade. This lamp shade was surplus to issue, after installing what I am calling my Moroccan chandelier over the dining room table. 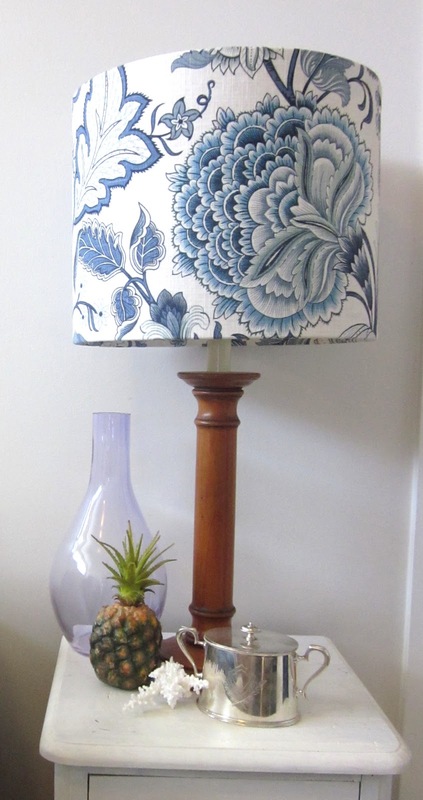 I had the lamp stands from Laura Ashley, when this kind of thing was all the go in the 1990's. I've been that close to chucking them that many times, but actually I think the darker wood fits nicely with blue and white fabric. It was so easy in the end and I am so proud of how it turned out. If you don't look too closely, you'd think I paid top dollar in a designer store. So here's what you will need for this project. I only ended up using the adhesive spray. I thought I'd need the PVA for the join, but didn't bother, as the spray worked perfectly well without any mess. 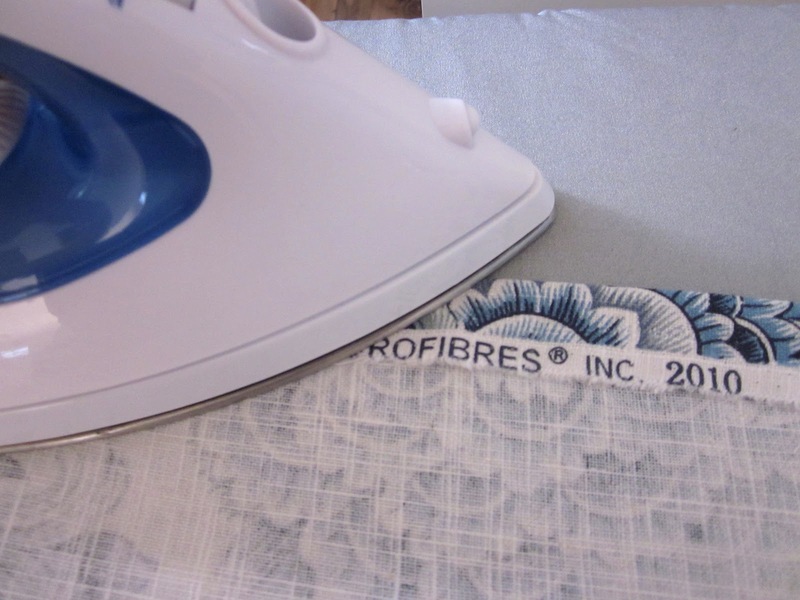 So I bought a metre of fabric and folded it over, ironing the seam to ensure I cut it straight. I also ironed the end seem so I would get a nice finish at the back of the shade. 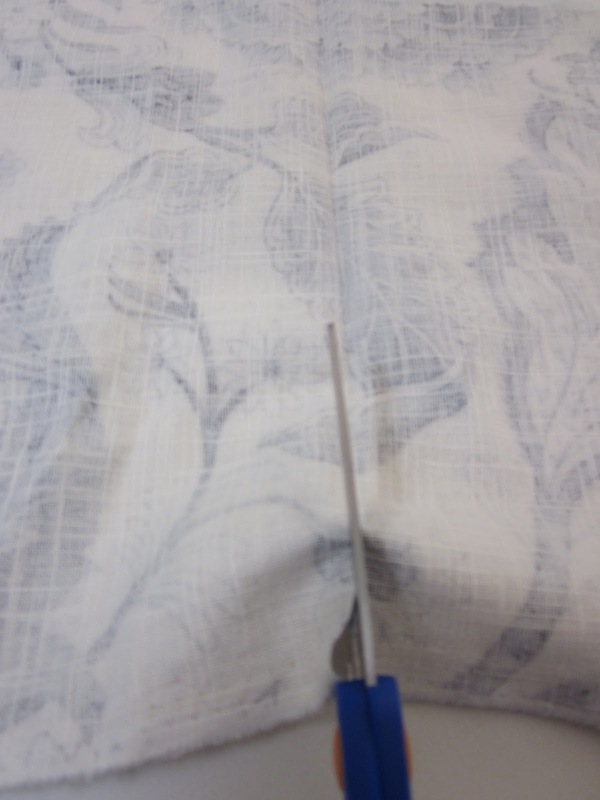 I measured it in three places across the seam, to ensure I ironed a straight line. My seam was 3cm/1inch. I cut the overhang where the wire stays were, so it was easy to stick it down on the inside. 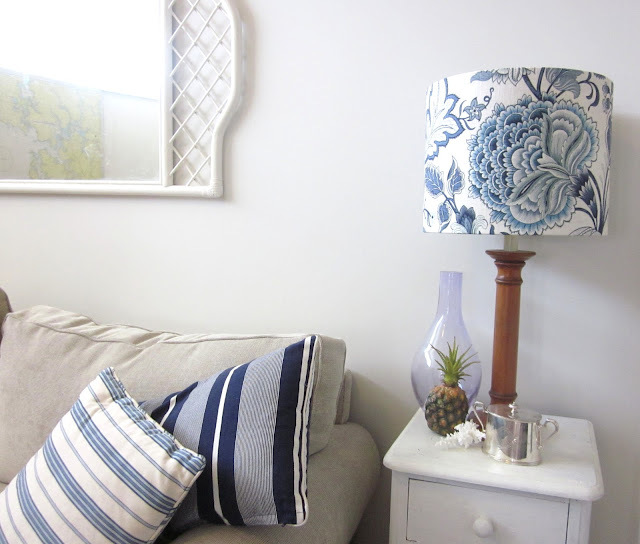 I did this on the other side too even though there were no stays, as it just made it easier to manoeuvre the fabric into place inside the lamp shade. 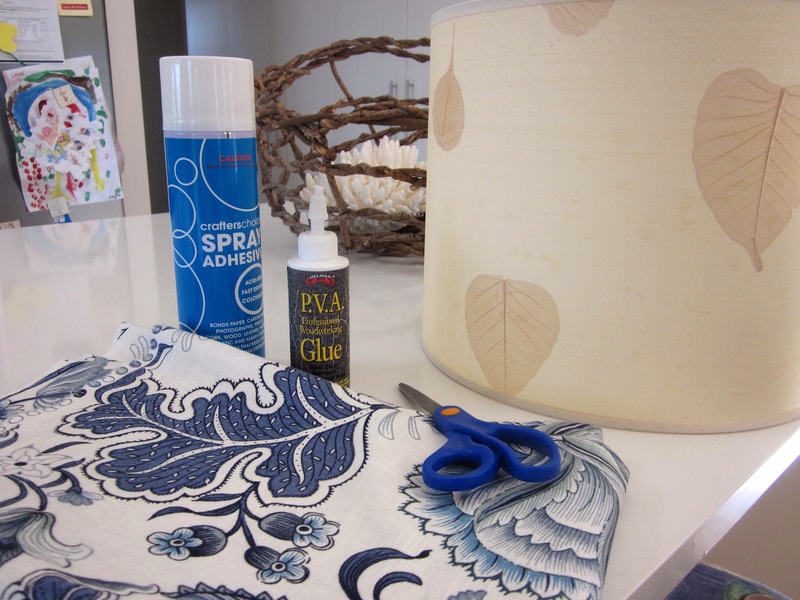 Before you start with the glue make sure you decide which way is up with your lamp shade and which way up you want your fabric to sit. 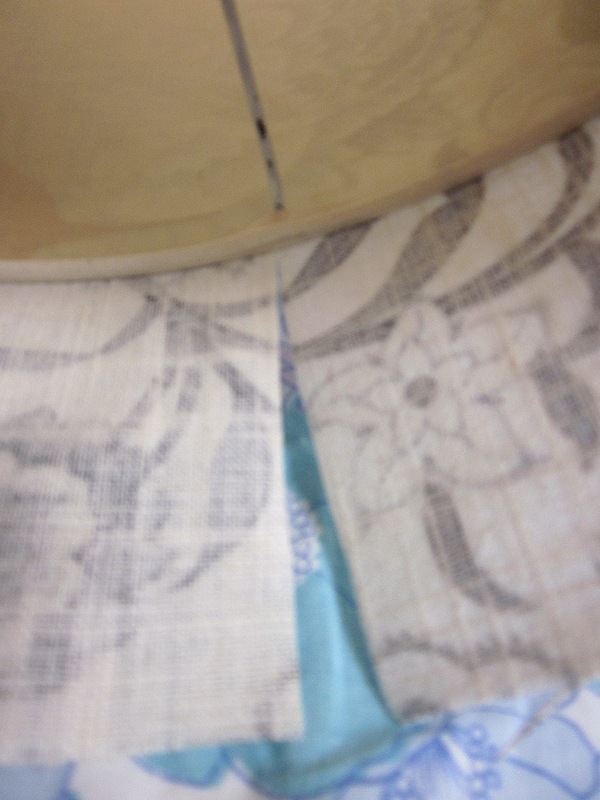 It's important to get the right tension on the fabric so it doesn't buckle and look bumpy. The glue was pretty forgiving and stays tacky for a while so I pulled it off once, to ensure all areas were smooth. That bit worked remarkably easily. You will also need to trim up your overlapping hem to about 1 inch or less. My overlapping bits were longer as you can see and when I turn the light on, you can see where the hem is. That doesn't bother me so I left it, but I did wonder what it was when I first turned the switch. This may not happen on thicker lampshades, but because mine was made of rice paper, it left a distinct line with the globe shinning behind it. Once she was done, I styled it up with a faux pineapple and some lovely thrifted Hardy's silver. I mean how can people throw this stuff out I wonder. I added some coral for a little coastal pop. 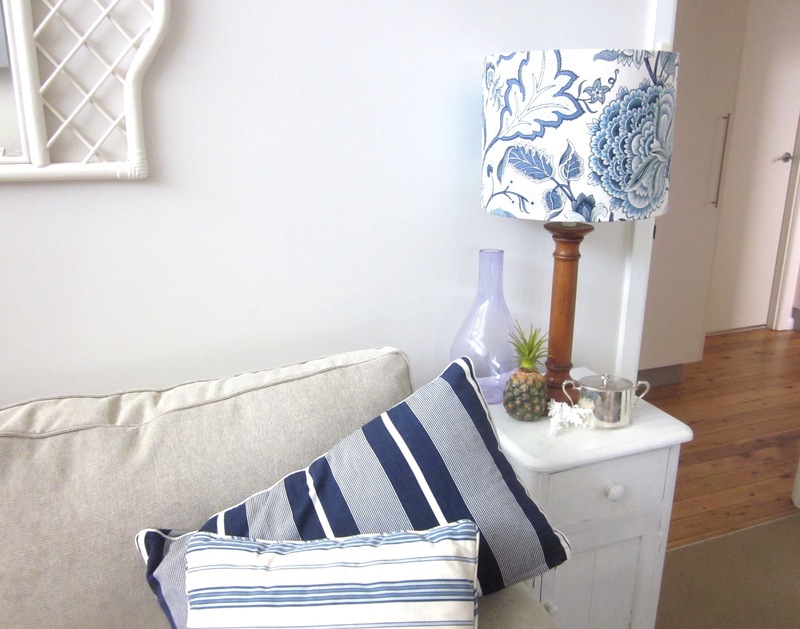 Along with $5 thrifted bamboo mirror, we have a coastal Hamptons, tropical, coastal thingy in motion and I for one love it and can't wait to complete the lampshade for the other end of the room. It's not perfect, but it cost me very little and has certainly lifted the room in a big way and that's what we are all about here on this little blog people. Looking good on a budget. I've lived by that rule all my life and today it's working for me. Nice job, Carolyn! Very pretty! I love the lamp shade!You made good work. I also love the painting with the boats behind it in one of the photos.AriadnefromGreece! Love how it all came together! I have a lamp to do up too- when I get the time and actually decide what I want to do with it! it looks great, i love the fabric! room with the other one in it. Looks great Carolyn. Love the fabric. I totally get how you feel when you've made something for very little money and it looks great. I really need to do this. Thanks for sharing. You've inspired me. What a gorgeous difference, great choice in fabric. 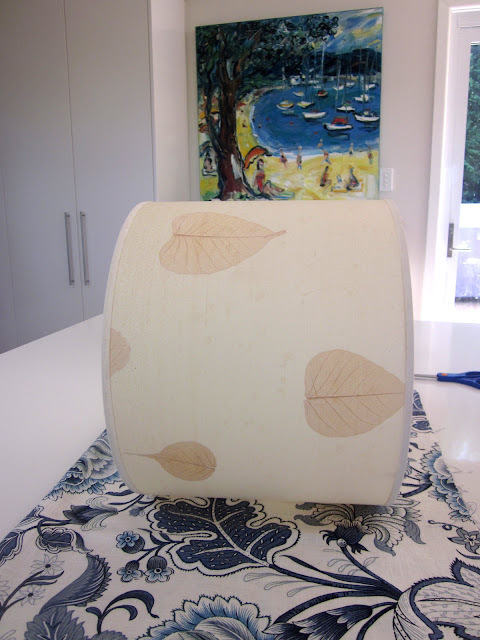 I've never tried to recover a lamp shade but with your excellent tutorial think I might be able to wing it. I tend to let projects scare me off instead of just going for it. 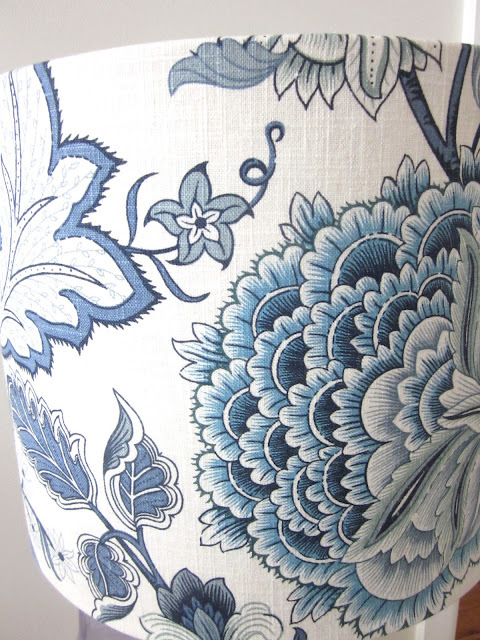 The colors and pattern on your fabric sure would wake up a room, so bright and clean looking. 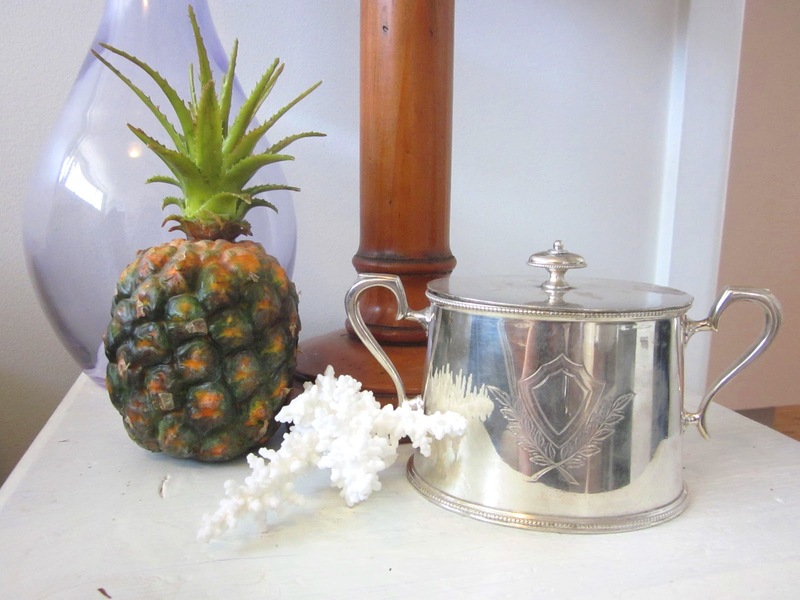 I'm so glad I found your blog as I love it and am entranced with Australia. I'm not always too happy with my other half. We're together 24/7 and there are times I'd happily bonk him one. He was a trucker for years so I was alone alot, got used to doing what I wanted, when, so when he bugs me I come into my studio and write comments to wonderful bloggers and get awesome ideas. Thanks for your kind words. I've tried to find a blog for you several times so I can see what you're up to, but with no luck. Are you a blogger? I've never had the guts to do this but now I think I might have a go. It looks awesome. I love all the other bits next to it too and the thrifted mirror. The effort to happy factor ratio on this project was an inverse relationship. It was so easy and made me very happy. So glad to have inspired someone. great tutorial carolyn, I think I might try this. Your choice in fabric is lovely! It was providence that I read your post today. I have an ugly shade that needs replacing, but I can't find one that fits on the lamp. I have the fabric so now I just have to buy the spray adhesive. Not singin' any blues over this fab blue/white lampshade! Looks stellar! Great job, looks gorgeous - you beat me to it. Just had mine made into curtains. Can't wait to get them up. Beautiful makeover. I love all of your coastal accents. You have a lovely home. Beautiful, love that fabric! Saw your link at Met Monday, thanks for sharing with us! That turned out really good, I have a lamp that needs to be redone and this has inspired me to do it. Wow that really looks great. I have been wanting to cover a lampshade we have. I just have to find the perfect fabric. Thanks for sharing at DIYbyDesign. So lovely! Saw you linked up on some blog hops. Would love it if you linked up on my blog hop and added it to your list www.w-t-fab.com/search/label/bloghop. Also let me know if you'd like to follow each other! That fabric is just gorgeous, and you did a super job with your lampshade--I love it! Looks like from all the comments you got this is a very popular project. Inspired several people, myself included.